It has been well documented that treatment rooms and kennel areas have high levels of viruses and bacteria. In fact, canine infectious tracheobronchitis (kennel cough) is one of the most prevalent infectious diseases in dogs. Kennel cough is most commonly associated with a bacterial infection caused by the organism Bordetella bronchiseptica. Air Oasis Kennel Air Purifiers significantly reduce the viral and bacterial infections that can spread throughout veterinary clinics, kennels or day care play areas, solving a major problem these facilities face. 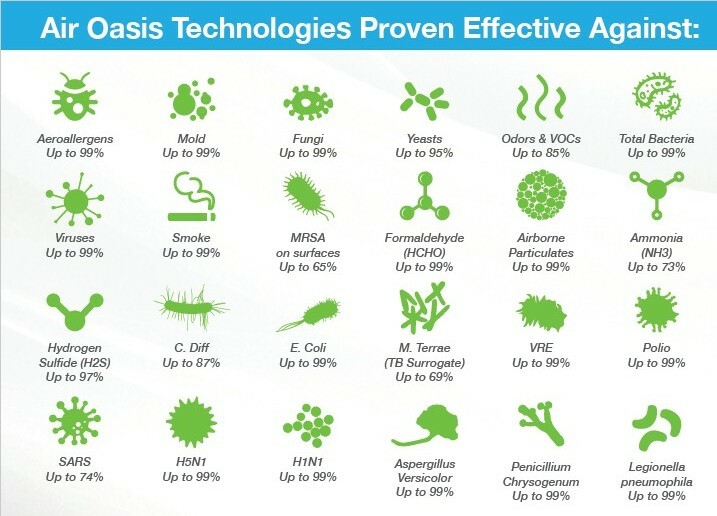 Air Oasis air purifiers use a patented nano Nickel Hydration Ionization technology that drastically reduces airborne odors, mildew, molds, yeasts, viruses, bacteria, chemicals, fumes, volatile organic chemicals (VOCs) and odors. Additionally, they remove particulate from the air by creating an electrostatic field which reduces static electricity and causes particulates to fall out of your breathing space. Particulates include dust, dander, fog, fume, mist, smoke, sprays and many other allergy causing particles. Destroys objectionable odors from medicines and chemicals. Significantly reduces cage and animal odors. Stops the spread of Kennel Cough. Aids in prevention of respiratory infections. Simply plug it in and let the purifying begin. Low Maintenance. Just replace the AHPCO Cell once every 2 years on all models. The following models are ideal for waiting rooms, kitchens, laboratories, operating rooms and business offices or smaller kennels. How many units needed depends on how many animals are in any given room. For help determining your needs, call us toll free at 866-875-4386 or send an email. Ideal for kennels, animal clinics, veterinarian offices, pet stores with high pollution levels and many animals. The Air Oasis 5000PRO air purifier is a commercial unit, but still available to the public. This unit contains two 9 inch AHPCO Cells and two fans. High speed engages both fans and cells, while low engages only one fan and one cell. Each unit can treat a room with roughly up to 20-30 animals, depending on the type of animals and the cubic air space in the room. The larger the room or the greater the number of animals, the more units are needed. The Air Oasis G3 1000 UV Air Purifier is ideal for combating harmful contaminants in smaller spaces up to 700 square feet with 1 to 2 dogs. It also works in small offices, restrooms and kitchens. Air Oasis G3 3000 Air Sanifier is the perfect unit for medium sized areas up to 1500 square feet with up to 6 dogs. The bigger the contaminant problem, the less square footage the unit can do. For instance, if you have new furniture or construction that off gasses VOCs, the G3 3000 might cover only 1000 square feet. The Air Oasis G3 3000 Xtreme UV Air Purifier is perfect for more contaminated areas with higher levels of known contaminants such as pet odors, mold, VOCs and more. The AO 3000 Xtreme is also great for small commercial applications such as for grooming areas with several animals, pet breeders, etc. The Xtreme is twice the strength of the Air Oasis G3 3000, enabling you to have a much higher level of effectiveness in areas of higher contamination, while maintaining safe ozone levels. The Air Oasis G3 Mobile air and surface sanitizer gets rid of animal odors and airborne bacteria and viruses in your car, van, camper, hotel room or other small space up to 250 square feet (square footage covered varies, depending on the pollution levels in the space and the occupancy). The Air Oasis G3 nano HCT HVAC 9" Induct UV Air Purifier is for average to large sized buildings up to 2000 sq. ft. per air handler, assuming an 8 foot ceiling and depending on cubic air space and contaminant sources and levels. This model works well in small commercial applications like kennels, pet shops, medical and dental facilities, business offices, etc. Need Help Determining Which Model(s) You Need? From experience, once we know the cubic air space to be treated in each room, the number and types of animals in each space, peaks and low times and room activities and layouts, we can determine which models are best for a given space and season. For help determining your needs, call us toll free at 866-875-4386 or send an email. We also offer quantity discounts. The following air cleaner options have the ability to reduce airborne particulate much faster than the Air Oasis because they have more powerful fan options -- thus they are noisier. If dust is your biggest problem, they will work better at quickly removing the dust from the air.